Payment of 1st Installment of Advance tax for Companies At least 15% of Tax on total inome for the year. Interest u/s 234C @1.5% per month or part of the month. Payment of TDS deducted for the month of May,2015. Quote AY-2016-17. Interest @ 1.5% per month or part of month from the date of deduction till the date of payment. 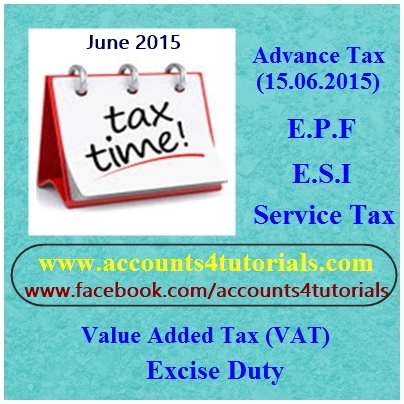 Payment of VAT and filing of VAT 100 for May,2015. Consolidate Statements Due and Remittance under EPF &EDLI Form 12A. Employee State Insurance Corporation (ESIC) | LegalRaasta, ESIC is a self-financing social security and health insurance scheme which provides the medical benefit, etc. LegalRaasta can help you with ESI registration.